Mount Washington is a neighborhood on the east side of Cincinnati. It is located about ten minutes east of Downtown via Columbia Parkway and Beechmont Avenue, or a slightly longer drive via Riverside Drive (formerly Eastern Avenue) and Kellogg Avenue. As one of Cincinnati’s 52 neighborhoods, Mount Washington lies within the city corporation limits, and borders the Cincinnati neighborhoods of Anderson, East End, and Mt. Lookout. It is only a few minutes down the hill to Lunken Airport which has a 6.6 mile running and bike trail, tennis courts, public golf, playground, and more. Otto Armleder is nearby, which claims to be the best free dog park on the East side! The Mount Washington Water Tower, located on Campus Lane between Beechmont Avenue and Sutton Avenue, is a noted Art Deco landmark and is decorated top-to-bottom with lights every Christmas. Mount Washington is home to numerous small businesses, many of them located along Beechmont Avenue in the main neighborhood business district, “The Mount Washington Water Tower District”. Mount Washington contains historic homes and distinctive architecture. Housing stock in the neighborhood is diverse, with values ranging from modest bungalows to million dollar estates. Wilaray Terrace, Honeysuckle Lane, and Honeysuckle Drive are lined with architect-designed homes, built from the 1920s to early 1960s. Other streets, such as Adena Trail, contain homes built throughout the later twentieth century. The Lower Salem area, located along Salem Avenue between Wayside and Kellogg Avenues, contains sprawling estates and large homes. Sands Montessori, a magnet school now housed in a new building (2011). McNicholas High School (Roman Catholic Archdiocese of Cincinnati) is also located in Mount Washington, across from Guardian Angels. Since Mt. Washington is within the City of Cincinnati limits, there are many other Cincinnati Public School options for grade school or high school. There are also many highly ranked private schools located within a 15 minute drive. Many of our clients choose Mt. Washington because of the convenience to downtown, affordable housing, and nearby restaurants/parks/shops. ‘Area Vibes’ ranked Mt. 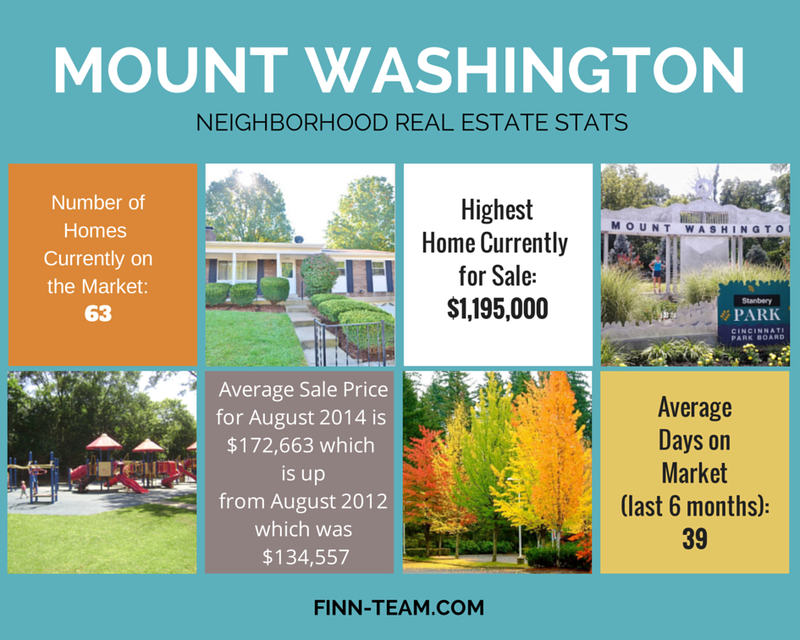 Washington as “Very Livable” due in part to low cost of living, stable housing market, and high graduation rates. Spacious Tudor Near Ault Park! OPEN HOUSE THIS SUNDAY! Convenient Lifestyle at Regency Square! OPEN HOUSE THIS SUNDAY! Better than New in Fort Thomas! Dollhouse with Charm and Modern Updates… Just Blocks from Mt Lookout!